This week marks the end of the Las Vegas Furniture Market which was the first major market post the demise of Berkline. For this reason, there were many brands introducing large home theater offerings - some for the first time. Lane Furniture brought 15 new styles to the show, many completely new designs incorporating sought after features like contour seating, chaise style foot rests and power headrests. The offering is by far the largest in new home theater from any one single brand. One promising design is the Bijou group which incorporates all these features. 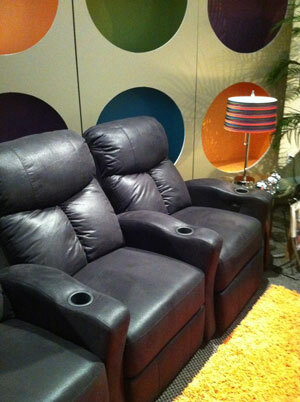 Other more familiar models include the Matinee 103 which is the same design as the Berkline 12003 Reno. Another Berkline favorite now being offered by Lane is the 13175 model which Lane have developed as the Grandslam 175. Other brands offering new introductions to this category are Klaussner Furniture, Barcalounger and Mac Motion to mention just a few.